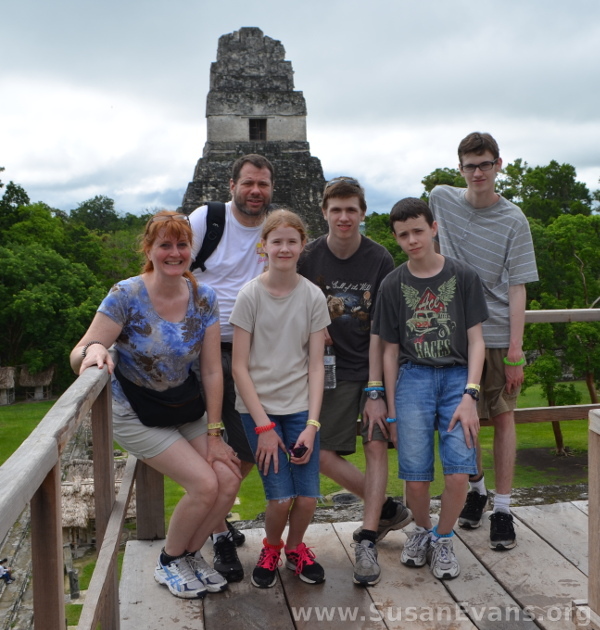 Come on a tour of Tikal, Guatemala with our family! This was the most exotic place we went in Guatemala. 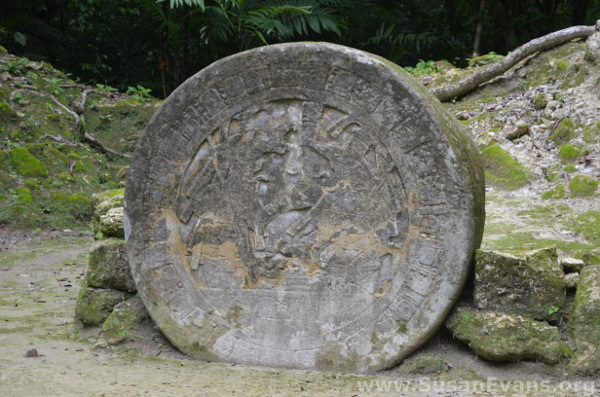 Driving to Petén (the north area of the country where Tikal is located) took us 11 hours instead of 9 because of traffic and mud slides on the freeway. Speed bumps also slowed us down in the villages. By the way, all the vehicles–including buses and motorcycles–drive twice the speed limit that’s posted. 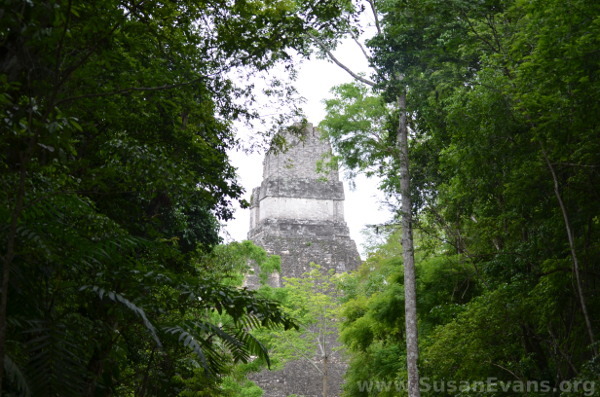 The ruins of the temples that look like pyramids in Tikal are breathtaking. These ruins are surrounded by green jungle growth, moss, and trees. The steps of the “Gran Jaguar” are so eroded that visitors are no longer allowed to go up. 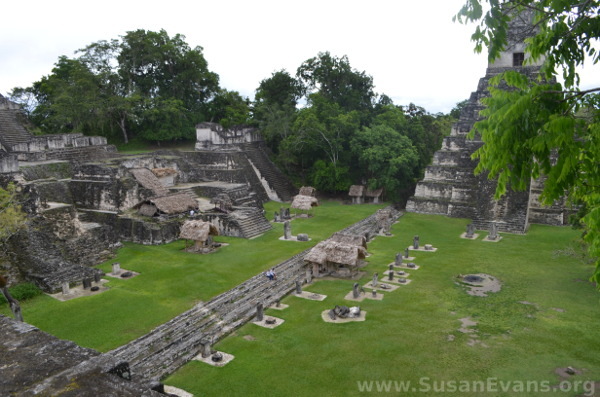 The temple opposite the “Gran Jaguar” has public wooden steps at the back that prevent further erosion of that second temple. Many stones (almost like over-sized tombstones) are located at the bottom of the pyramids. The etchings on these large stones are a mystery. I happily told my kids this was a Mayan library. 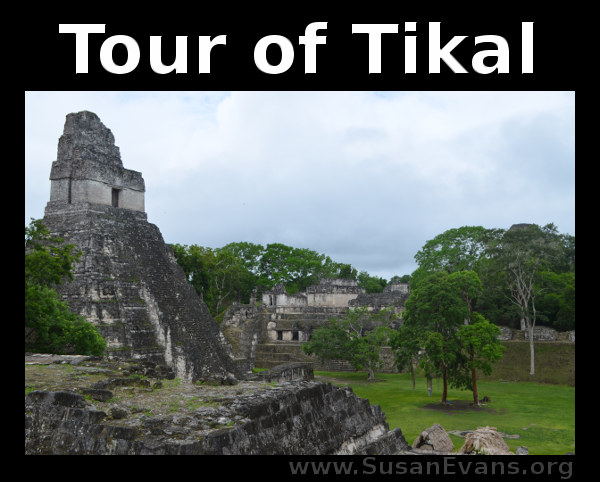 For all my children, seeing the temples of Tikal was one of the highlights of the trip. This entry was posted on Monday, July 17th, 2017 at 8:00 am	and is filed under Travel. You can follow any responses to this entry through the RSS 2.0 feed. You can skip to the end and leave a response. Pinging is currently not allowed. Very cool although sometimes ancient pagan temples give me the willies. I would love to see wild monkeys! I know what you mean about the pagan rituals that used to be performed there. It is creepy if you think about it. Thankfully those rituals are no longer performed there! Once we happened to arrive the night before full moon and there were lots of foreigners there for the pagan activities they planned for the next night. You mention “the freeway” are you talking about from Guate towards Lake Izabal? It was still two lane (one each way) last time I was there. And the road north after Rio Dulce all the way to Tikal and Belize was dirt (or mud, depending on the season). 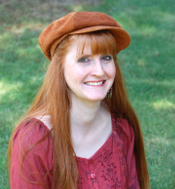 So it sounds like there’s been lots of changes. We lived in Xela. two lanes from Guate to Xela. Then they made it four lanes over the mountain to S Lucas Sac. Now Google maps shows it goes all the way to Xela. Have you seen the original Star wars movie and figured out which pyramid was which? And I remember clapping my hands and listening to the Quetzal or the Jaguar (depending on which of the two facing pyramids you were on) and realizing those people were able to space the baffles in the room at the top just right to get that sound. Amazing. I had no idea that people still did pagan rituals there. Hopefully it wasn’t human sacrifice, since there are laws against murder. The taller pyramid is the Great Jaguar. One of these days I’ll save up enough money to go to Guatemala – it looks like a beautiful country! Your pictures make me want to schedule a trip! Looks like it was fantastic! It was! And it’s definitely worth going to Guatemala! Wow! I bet that was absolutely breathtaking. How fun for your family. The panorama from the top of the pyramids was definitely breathtaking. Ah, it is so beautiful there! I can’t imagine just seeing monkeys surrounding me without being in an enclosure. And that’s funny, a Mayan Library, it should would seem like it! Enjoy the beauty there! 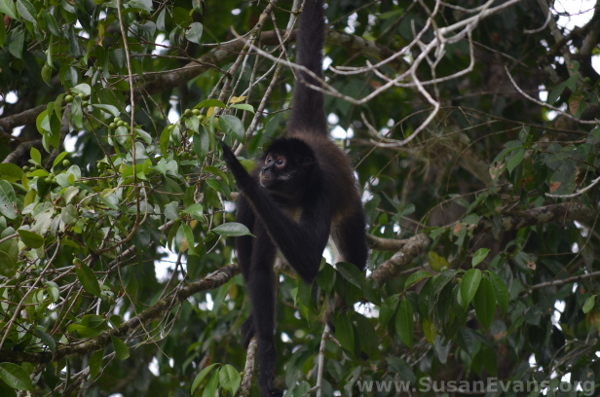 I was told that the wild monkeys sometimes poop on your head, so there are drawbacks about not being in an enclosure. This looks like a wonderful place to visit. i have friends who have been on mission trips there, but I have never been. It definitely is a wonderful place to visit! Oh, wow! I love seeing ruins. This sounds amazing. And isn’t it amazing how traffic laws are really more like suggestions! LOL! The traffic laws are really a joke there! I saw a stop sign right next to a green light. If you have a light, you don’t need a stop sign, or hardly anyone would get through the green light!